This Tech Tip explains how to change all the lines in a drawing to a different pen colour. In order to change all the lines in the above drawing to black, the first step in the process is to select all the lines in the drawing. This can be done in various ways, the easiest being using the Ctrl A key combination, this will select all the drawing entities, lines and text. Click on the Pen button to change the pen colour. Select the required colour, we will select Black, click OK to continue. Deselect All and select Pen, click OK to continue and then OK again. 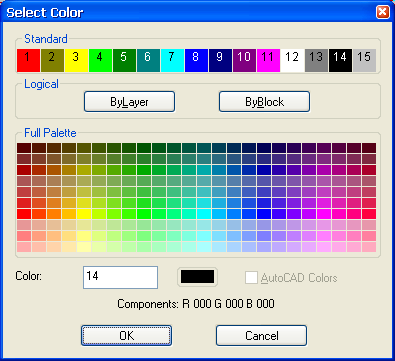 Left click on the drawing to clear the selection, all the lines will now be changed to the colour selected. AllyCAD is a registered trade mark of Knowledge Base (Pty) Ltd, Developers and distributors of Professional Civil Engineering and CAD Design Solutions.